Once a state with one of the fastest-growing prison populations, Connecticut is now one of three states projected to maintain the same number of inmates through 2011, according to a study released Wednesday by the Pew Charitable Trusts. Using state extrapolations, demographic trends and criminal justice policies, the study's authors say the state, along with New York and Delaware, will buck a national trend of inmate increases over the next five years. 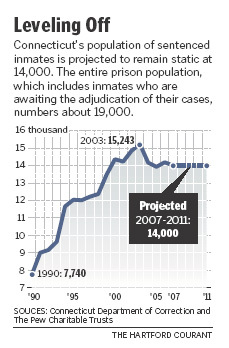 Nationwide, the prison population nationwide is expected to rise 13 percent, or by 192,000 inmates, in that period. The study by Pew, a nonprofit, nonpartisan research organization, also draws the conclusion that there is no direct link between imprisonment rates or corrections spending and crime deterrence, and holds up Connecticut as a model for controlling prison growth. The study lauds Connecticut officials for rehiring 96 laid-off probation officers in January 2004 and instituting programs to reduce the number of parolees and probationers sent back to the prison system for technical violations. The state achieved a goal of reducing those numbers by 20 percent, and as a result, many say, saw its prison population decline in 2004 and 2005. "We highlighted Connecticut in our opening remarks because we are really trying to emphasize that the size of the prison population is not controlled by abstract forces, it really does result from the policy choices the state makes," said study author Adam Gelb, referring to comments made about the state at a Washington, D.C., press conference that announced the study. The findings, experts say, could have policy implications in Connecticut, which first reversed a 15-year rise in inmates in 2003, but still grapples with overcrowding. "The key is to resist doing the simple thing - dumping a bunch of money into a new prison," said Rep. Mike Lawlor, D-East Haven, co-chairman of the legislature's judiciary committee and a former state prosecutor. More than what the study could mean for overcrowding, though, Lawlor said the study highlights the fact that officials in Connecticut conservatives and liberals alike have agreed to a new approach dissecting the series of decisions that land a person behind bars. Some offenders deserve lengthy sentences, he said, while others only "need to be locked up for a short period of time," he said. While the study and rosy projections are certainly flattering to the state, the DOC has come under media scrutiny for increases over the past few months in the prison population after declines in 2004 and 2005. The most recent figures released in January by the Department of Correction show that the prison population reached 18,902, nearing the system's peak of 19,216 reached four years ago in January 2003. Of the 18,902 inmates, approximately 14,000 are convicted and sentenced. The rest, about 4,000, are being held in lieu of bond awaiting trial. The recent spike in the inmate population is exacerbated by the fact that there aren't enough beds for inmates, who continue to sleep on mats on gym floors, with dozens sharing few toilets. Brian Garnett, the corrections spokesman, concedes that overcrowding is an issue, but said the figures would be much higher if the department hadn't collaborated with legislators and so aggressively worked to reduce recidivism among parolees and probationers. "The important perspective, while we are crowded, we'd still be more crowded if not for the steps we've taken," Garnett said. Larry Dorman, a spokesman for AFSCME Council 4, which represents 17,000 state employees including the three correctional locals, said that the study reinforces the union's concern that the prisons are short roughly 600 correction officers. "If you couple that with the Pew report, which projects a static prison population, the problems we've identified are going to continue," he said. "The most effective way to keep violence and mayhem at a minimum is to keep an adequate number of posts and to staff them adequately." The state's $13 million parole and probation recidivism efforts focused on parolees and probationers locked up for non-criminal offenses, such as being late to a meeting with an officer or for losing a job, and thus, failing to meet a probation requirement. "It's too easy to do it - ah, just send them to jail," said Lawlor. The theory was that by hiring more probation officers, and reducing caseloads, the probation officers had more time with clients to pinpoint programs that might keep them out of prison. The state also developed initiatives in neighborhoods identified in New Haven and Hartford as areas with high concentrations of parolees. When asked if the drop in inmates the state experienced between 2003 and 2006 could have resulted from a statistical aberration, Gelb, the study author said no. "When you go from being one of the highest-growth states to the lowest over a couple of years, and that doesn't happen by chance," Gelb said. "Things in criminal justice tend to move slowly. So when there's that dramatic a change in that short of time, it has to do in large part to the policy change."